324K Real Estate Pros Vouch For Inman Select: Are You In? When it comes to growing your own real estate business, it’s important now more than ever to keep up with the increasingly fast-paced and dynamic industry in which you operate. Real estate intersects with everything from the tech revolution on the West to the push for policy overhaul on the East. Coast to coast, the industry is contending with changes that pose new threats and bring fresh opportunities 24/7. The average real estate agent today must fight for scarce listings, engage clients through online marketing and build a killer pipeline all without breaking a sweat. But who wants to be average, anyway? Those requirements are just a baseline to keep your license from collecting dust. The true pros deliver results for their clients, have their thumb on the pulse of the market both local and national, leverage the tools that their competition never dreamed of, watch and learn from the industry vets, and succeed rather than survive. 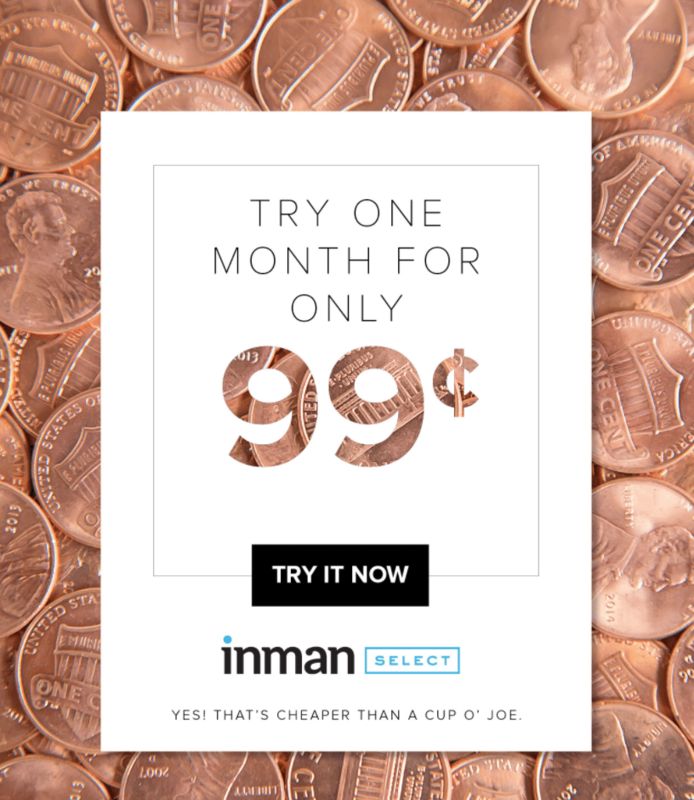 We invite you to unlock the resource that over 324,000 top industry pros use everyday to stay ahead of the pack: Inman Select, our members-only, real-estate intelligence subscription with dissected real-time news and information; on-demand videos; product reviews; monthly original research reports; how-to articles for every aspect of agents’ and brokers’ day to day; and economic and market forecasts from top industry leaders. And today you can partake in an exclusive offer: Join our members-only service for just 99 cents. The future of your business is worth the buck.